Description:Apply to vehicle Chevrolet Volt, Citroen C-Zero, Fisker Karma, Ford Focus Electric, Ford C-Max Energi, Mia, Mia Electric Van,Mitsubishi-I Miev, Mitsubishi Outlander Phev, Nissan NV200 SE Van, Nissan Leaf, Peugeot Ion, Renault Fluence, Renault Kangoo, Smiths Edison Van, Smiths Newton, Tata Indica Vista EV, Toyota Prius, Vauxhall Ampera... 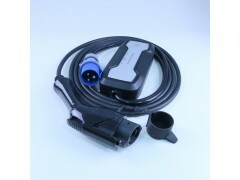 Product specification Mode2 (level 2) EV Charging Cable Model: BS-PCD019-T1-CEE Connector: Type1 to CEE Certificate: TUV, CE, UL Input/Output: 230V AC Frequency: 50Hz Current: 32A Power: 2.2/3.6kw Length: 5m (16.4ft) Color: black Cable: Straight Key Features -High compatibility. It can charge all EVs with Type 1 inlets, correctly and effectively -Easy operation. Simply connect the plug with the EV’s inlet, then the charger will automatically detect the connection status and handshaking protocol automatically, and starts charging -Switchable currents. Customers can choose an appropriate charging current according to the demand -High security. It has passed all tests of TUV. There are all kinds of protective measures to ensure the safety for every user -Containing the intelligent chip. It can automatically repair minor charging problems while charging. When a fault occurs, the lights will blink in different ways to indicate different problems.